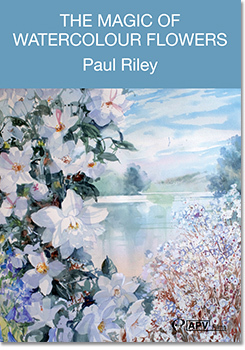 Paul Riley’s work is all about brushwork and colour. No, hang on before you give me that pitying look that says, “yes, that’s painting for you”, because you haven’t seen this, his first DVD, and I have. I was trying to find a way into the book that accompanies it and it was seeing Paul in action that gave it to me. To begin with the colour: the film starts, as they so often do, with an introduction to materials. 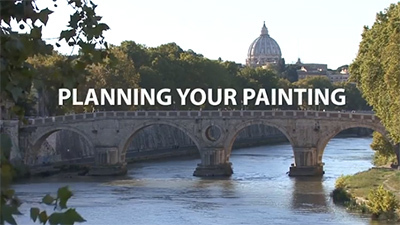 Yes, I know, all artists do it and, yes, they all uses brushes and paints and paper or canvas, yadda yadda. But this is different, because Paul explains in just a few minutes how mixing works, why some colours sparkle when you put them together and some don’t (it’s all down to the hue). He has an instinctive understanding that he is also able to explain, though you may want to rewind and take notes next time. Now, about this brushwork. The thing I noticed, time and again, was that Paul doesn’t paint what’s there, but what he sees, which isn’t quite the same thing. Although, in the final demonstration, he spends quite a lot of time on studies of the flowers of a camellia bush, exact, agonisingly precise detail is not important to him. The point is to capture the spirit of a group of flowers (he hardly ever paints individual specimens) and that’s where the “magic” of the title comes in. So, in spite of the studies, he doesn’t obsess over shape, shading and hue. The result is far more impressionistic. All this comes to the fore in the first of the outside demonstrations, white cherry blossom painted from under the tree, “a white picture on white paper”, as he puts it, going on to explain, “in order to paint light, you’ve got to paint where it’s not”. The whole thing thus becomes an exercise in shadows and negative shapes. Paul is too unassuming to call it a masterclass, but it is. Overall, the film builds nicely. It starts with the introduction to materials, which also gives us a chance to make the acquaintance of Paul himself. 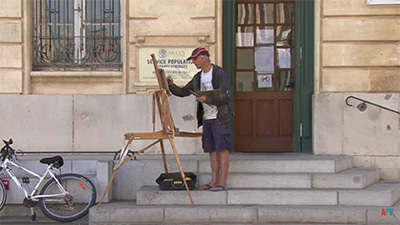 He has, he says, been painting watercolours for fifty years and it’s amazing that this is his first DVD. He has been teaching and writing, though, and the experience of that shines through. The commentary is always thoughtful and engaging and I found it utterly compulsive. Apart from anything else, there are the pearls of wisdom and insight that pop out all the time, my favourite being, “Even Jackson Pollock was a Pointillist of a kind”, during a spell of spattering – and he’s right, isn’t he? This has been made to accompany the book of the same title and I’d strongly recommend them as a combined purchase. The book gives you that stop-motion breakdown that you can take at your own pace, but you also need the DVD to get Paul’s personality and way of working. “I enjoyed that”, he says at the end, clearly having done so, “and I hope you did.” Well, he’s got my vote. There is a wonderfully fluid quality to Paul Riley’s work. His use of line and colour is deft, subtle and instinctive. It also looks simple but, like so many things that do, it’s the result of a great deal of background work. When a brushstroke goes down, it’s because it’s meant to be there. You get few happy accidents. The result of thoughtful painting is usually excellent teaching and it’s the case here, because Paul knows the exact reason for every mark he makes. In the DVD which accompanies this book, and which you really should try to see, his commentary is much more “what I’m going to do” than “what I’ve done”. In print, this leads to a discussion of flower painting rather than a series of extended captions, although he can do those too, when required in the demonstration paintings. I think it’s fair to say that you wouldn’t come to Paul for a guide to painting flowers per se. Although they are one of his main subjects, they’re almost always part, albeit the centrepiece, of a larger arrangement. Botanical illustration, or even the less formal flower portrait, this is not. For the most part, too, the details of individual blooms and flower types don’t bother him. It’s more about colour, shape and perspective and, as I’ve hinted above, he explains this really rather well. I honestly think you should regard this book and its accompanying DVD as a combined purchase. I’ll also stick my head above the parapet and suggest that they’re both not so much about flower painting at all, but about colour, line and form. And, as that, the result is a masterpiece. 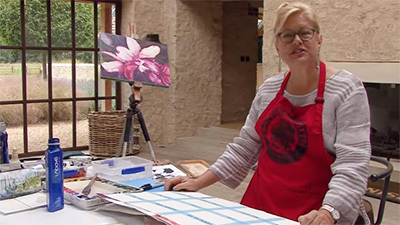 Complementing the book of the same title, published by Batsford and reviewed in Leisure Painter last month, The Magic of Watercolour Flowers brings Paul Riley’s teaching to life with an excellent DVD showing the artist at work. 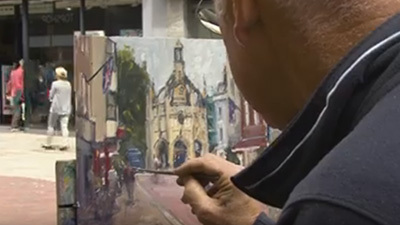 With 50 years’ experience of painting in watercolour, Paul has a surety of touch that is fascinating to watch. He starts off in the studio, firstly discussing the materials he uses then working on two paintings of flowers with still-life objects. 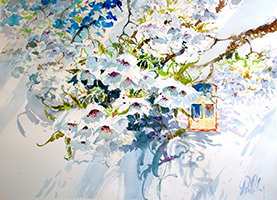 He moves outside to the courtyard to tackle what he describes as “a classic watercolour conundrum” – the difficult subject of cherry blossom, involving the painting of white on white paper. Letting the white of the paper shine through, the picture sparkles with light. The DVD concludes with a demonstration of a spring garden beside the river Dart near his home. 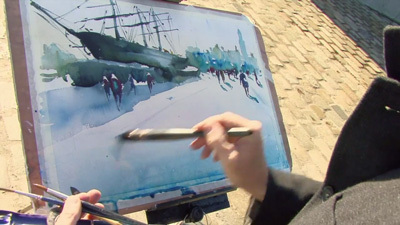 Paul Riley has been painting watercolours for 50 years. Amazingly, this is his first DVD, but it’s certainly been worth the wait. He is an accomplished and confident presenter who drops pearls of wisdom into a commentary that really does keep you on the edge of your seat. Even the obligatory introduction to materials contains more insights into colour mixing that I’ve seen in many whole books. 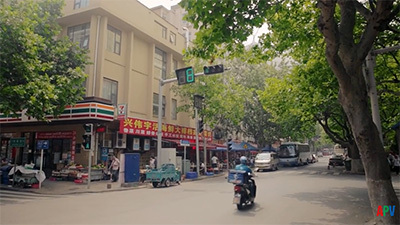 The film comprises two sections. 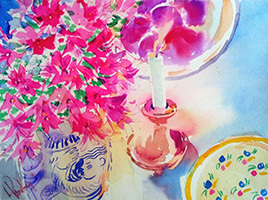 The first is studio-based and includes two small-scale still life’s where Paul’s brushwork and instinctive understanding of colour are condensed into short demonstrations that showcase the subtlety of candlelight and the tricky subject of glassware. Outside, Paul paints cherry blossom from right under the tree, ‘white picture on white paper’ where the answer lies entirely in the negative, non-white, shapes. He concludes with a broader landscape with the foreground dominated by a camellia bush. If you want to capture the spirit of flowers, that ethereal, magical quality they have in a garden or a display, you’re in the right place. The word ‘magic’ is used a lot in art book titles, but it’s entirely apt here. 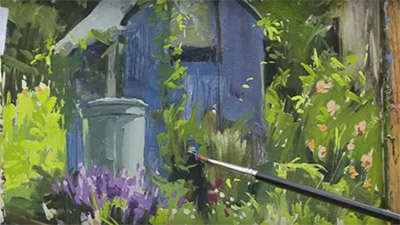 There is a wonderfully fluid quality to Paul Riley’s brushwork that’s showcased in the accompanying DVD, which I’d regard as an essential companion purchase to this. Paul is less concerned with simple representation than with shape and movement and he uses both brushwork and colour to give his paintings a dynamic quality that is bordering on unique. Although not a technical manual, this is an enjoyable take on a familiar subject.